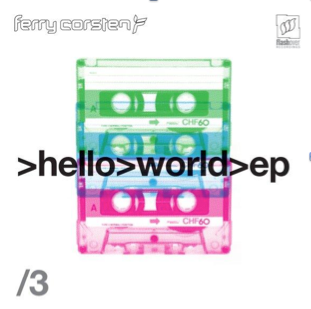 Earlier this year trance DJ/producer Ferry Corsten announced his three-part ‘Hello World’ EP series, a globally-influenced project exhibiting his far-flung musical inspirations from dancefloors the world over. The first edition, released in February, saw Corsten tap vocalists Haris and Angelika Vee to create the tracks ‘Back To Paradise’ and ‘Beat As One’. The follow up ‘Hello World 2’ debuted in July bringing uptempo, dancefloor tracks such as ‘Reborn’ and ‘Find a Way’. As 2015 comes to a close, so will the ‘Hello World’ series. Its third and final installment comes out 11 December. You can pre-order Hello World EP3 now via iTunes and receive the track, ‘Hearts Beating Faster; featuring Ethan Thompson instantly. Corsten has also offered up a preview of his synth-driven ‘Follow You’ on SoundCloud.